Had coffee with a relatively new friend last week. This friend had recently accepted a senior position with a health care company in town. Not surprisingly, we talked about her new role and the process she went through to find it. She talked a lot about her focus on finding a position that would allow her to do meaningful work. Work that truly makes a difference in people’s lives. And, I seem to be seeing this same theme in my feeds a lot lately. People looking for roles that are connected to a deeper meaning with the individual. So much so that I started to question my motives a bit. You see, I haven’t taken that route in my career. I haven’t worked for companies because they connected to a deeper meaning for me. Sure, it was interesting to work at Fairview and the hospital for a bit–that was a unique experience. But, it didn’t connect with me the way it does many others. It didn’t have MEANING for me. And, I’m 46. I’m starting to get to that spot in my life where I feel like I should be looking for work with that “deeper meaning.” So, maybe I’m starting to feel a little guilty about that. Maybe not. But, here’s my view on this. Meaning can take many different forms. I think when most hear “find a job with deeper meaning”, they equate that to working for a company that makes a difference in people’s lives. Working for a children’s hospital. Working for a non-profit that helps homeless people. That kind of thing. For me, the “deeper meaning” thing is a little different. For whatever reason, I haven’t ever felt strongly connected to a single cause or organization. I’ll admit, I’ve been lucky. I really haven’t had tragedy strike my life–that’s usually something that propels people to find more meaning. I haven’t been impacted personally. My version of “meaning” is pretty simple: I love my job. I go to bed on Sundays looking forward to the workweek. I’m thinking about work on vacation often (sshhhh, don’t tell my wife!). I truly love what I do. Took me 14 years to find it, but the last nine years as an independent consultant have been the best professional years of my career. I also find meaning in my work with students–although it’s not as much as I would like. I speak to student groups from time to time and absolutely love it. For years, I’ve been thinking that teaching might be a great ‘second act’ for me at some point. This is how I’ve found “meaning.” Now, could that change in the years ahead? Absolutely. Life has a way of throwing us curve balls. And, I’m sure it’ll throw a few at me before this is all said and done. But, for now I find meaning in my day-to-day work as a consultant, and by speaking with students and helping them along the way. And I’m fine with that. Hey, we’re all different, right? How are you finding meaning in your work? Eight years ago, I started an e-newsletter called “The HAPPO Report.” For those who have known me for a few years, I co-founded an “organization” named HAPPO years ago–Help a PR PR Out. This e-newsletter was an outgrowth of that organization. One year later, I decided to shift the focus of the newsletter to my business–and, more importantly, to be more focused on two things: 1) Open PR, marketing and social media opportunities in the Minneapolis/St. Paul area, and 2) Articles and posts designed to keep readers ahead-of-the-curve when it comes to social media marketing and PR. What started as essentially a whim in 2011 is now a regular, weekly e-newsletter with 1,400+ subscribers. I routinely received notes from friends and colleagues telling me how valuable they find the content. For many, it’s a must-read (readers’ words, not mine). 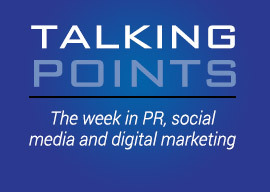 Talking Points readers range from those just starting out in the field to senior PR and marketing leaders at Fortune 500 companies. Most readers reside in the Minneapolis/St. Paul area. 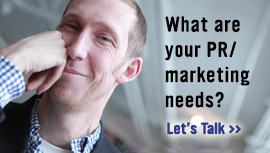 Got a job you want to share or promote with 1,400+ readers across Minnesota? Just $100 per will get your job in front of many job seekers. Looking for a new job? I’ll profile you front-and-center in the e-newsletter, which many managers and directors at companies and agencies across the Twin Cities read regularly. Cost: $200 per issue. Looking for a new way to share and merchandise your best content or messages? $100 an issue will give you that chance (exception: Competitors to ACH Communications need not apply–I’m not in the business of promoting my competitors!). A couple weeks ago, I attended my nephew’s fourth birthday party. At that party were seven kids (including mine) under the age of 14–Gen Z, according to the experts. Of course, we parents all had our phones out documenting many moments of this party. 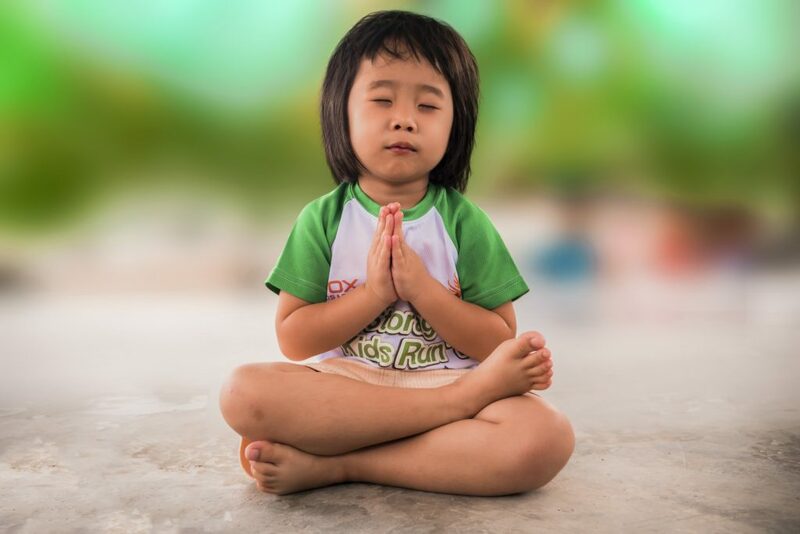 But, later that day, I couldn’t help but think about the kids at that party–my niece and nephew and my kids, and how we, as marketers, will be marketing to them in the next 10-20 years. Because it’s going to be wildly different from what we do now. Sound about right for most companies in 2019? Now, marketing to these kids in 10-20 years when they’re in that coveted 22-35 sweet spot? Going to be so much different. Just think about the realities they’ve grown up with. They’re the first generation to have their lives completely documented digitally by their parents. From every Instagram post celebrating a birthday (and now, even MONTH birthdays!) 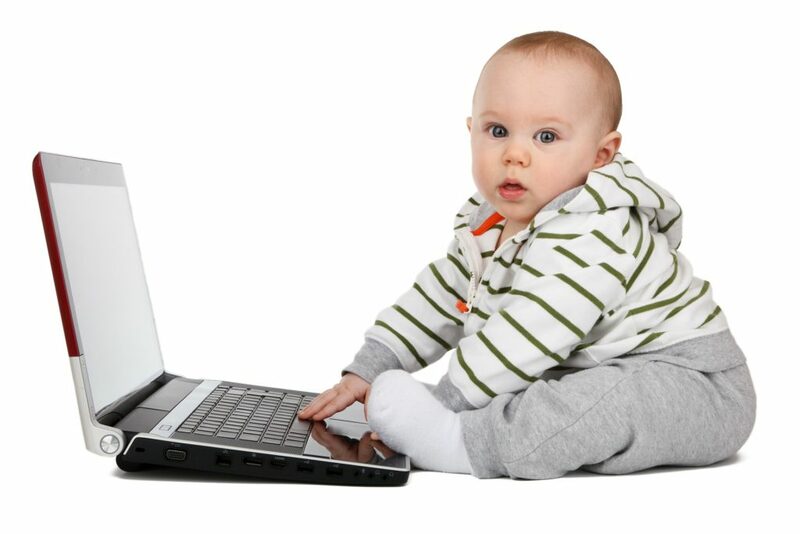 to every Facebook post, these kids have hundreds to thousands of pics of themsleves online before they hit the age of 10. Just think about that reality for a second and how all those pics Mom and Dad took impact their behavior. I think about how much this has changed from even 14 years ago when we had our first baby. At that point, we weren’t even taking pics on our phones–let alone documenting every day on Instagram. Huge shift in 10-15 years! Similairly, they’re also the first generation to have every achievement celebrated and documented, again, online. Think about all the pics and videos you see on Facebook and Insta celebrating basketball tourney wins, every band concert, every A in the gradebook. I mean, sure, we celebrated those moments 15-20 years ago, but it was with a random pic here and there and a pat on the back. The timing of technology also plays a big role. Almost all current grade schoolers and tweens have grown up with a smart phone–some, as early as the age of 6-7. Many were playing with iPads and their parents phone as early as age 2. That’s a big difference from some Millennials and Gen Yers who were teenagers before they touched their first smart phone, or us Gen Xers who were well into our 20s and 30s before we picked one up. So, society and culture is different. And, obviously tech has played a big role in that. But, these tweens have essentially grown up with technology attached to their body and as an essential too in their lives. And, like I said at the outset, it’s going to impact the way we market to these kids–big time. First, you most likely will rely more heavily on direct messaging, texting and other messaging apps than email to get their attention. This may be the first generation to completely ignore email (at least when they’re not at work). Again, think about the tech they grew up with–Insta, texting, phones. That’s their reality. Sure, companies are marketing to young people this way now, but not a lot of them. At every conference I’ve been to that talks about text or messaging marketing, very few people raise their hands when the presenter asks how many people are using this tech now? That number will ratchet way up in the next 10 years (heck, even 5 years!). Second, I think more companies will have to figure out how to be more effective with voice search and marketing. Z’ers are definitely the first generation to surf and search the web almost entirely by voice. I can’t remember the last time my son or daughter typed in a search on their phones! Something called LiquidLabs wrote a nice post on Medium last year summarizing a lot of this thinking. But, it’s not a stretch to say today’s grade schoolers and tweens will rely much more on voice search simply through their phones and the combo of Google Assistant + Siri (or, whatever those evolve into in the years ahead). Finally, I think marketers will have to adapt to today’s grade schoolers and tweens me-first mentality. You might say all generations have this WIIFM outlook, but these kids will take that to a whole new level. Think back to the first two points I made above re: how these kids lives have been completely documented online. First steps. First words. First birthdays. Firsts. And every second, third and fourth thereafter. It’s all online. Which means many of these kids are growing up thinking they are the center of the universe in a way we’ve never seen before. So, when approaching them, this will undoubtedly factor in. For instance, will they care, as Millennials do, about causes or issues brands take a stand for? I would guess they’ll be far more interested in how those same brands can develop products that will make their lives easier and more interesting. That’s just one example–but I think this “me first” mentality will be a big differentiating factor for how we approach this generation. In case you missed it, former Starbucks CEO, Howard Schulze is mulling over a bid to become the 46th president of the United States. And, currently, that’s causing some problems for the company he ran for many years. But hold up a minute, what about all those gurus, experts and agencies who have been telling me companies absolutely need to stand for something–both culturally and politcally? Case in point: A recent report from something called CompareCards.com claims that, in the past year, about one-third of millennials and Gen Xers boycotted a company or product that they had spent money on in the past. More than one-quarter of those age groups are still actively boycotting a product today. That report is hardly the only one. Over the last year, I’ve seen survey after survey reporting that companies need to take a stand. And, apparently, organizations are listening. Just look at Gillette’s recent ad for proof. Or, what about Patagonia’s huge campaign around Bears Ears National Monument last year? Or, Airbnb’s Super Bowl ad tackling immigration? Companies are taking stands. The “research” claims more brands should be doing just that. So, why the hesitation from Starbucks? A brand, mind you, that has, historically, been out in front of various issues including the opportunity to obtain a college education at a reasonable price. I’ll tell you why: Because taking stands politically doesn’t make good business sense. At least not for most companies. Sure, Patagonia’s campaign was smart. The bulk of their customer base most likely resides on the left side of the aisle. And, they’ve been fighting the good fight around environmental issues for YEARS. That “stand” was simply a continuation of what they’ve been doing forever. But, when companies like Gillette come out of nowhere and take a stand on an issue like sexual harrassment, well, it’s just kinda weird. And, it feels forced. In this case, I don’t think a political stand would feel forced for Starbucks. But, it certainly would alienate a whole slew of customers. And, apparently, it already is alienating a whole bunch of employees. And, oh by the way, those employees drink Starbucks coffee, too! 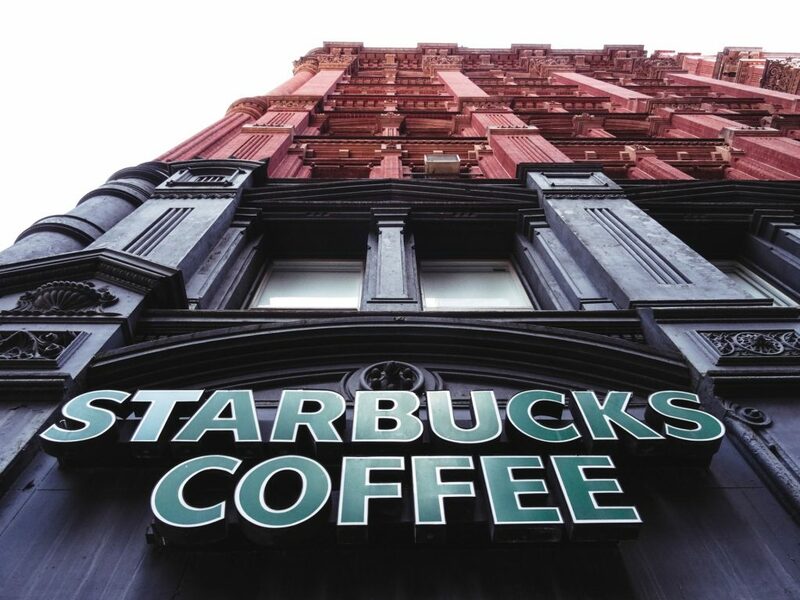 So, as cute and “on trend” as it is to tell brands like Starbucks to take a stand on political issues and presidential bids of former CEOs, in the end, as always, it comes down to business. After all, that’s why Starbucks exists–to sell coffee and make money. Pure and simple. I don’t see any political stands in the future for this coffee company. In case you missed it, Buffer came out with a fantastic “State of Social” report in January. I say fantastic, because Buffer has been a first-rate publisher of insights and opinions on its blog for years. I dare say Buffer may be the best tool, platform or social media company blogging today (I also love Hootsuite’s blog). So, when they released their annual report, I was quick to bookmark it for careful review at a later date. After sifting through the data and charts, I started to notice a number of takeaways that the Buffer folks didn’t call out. 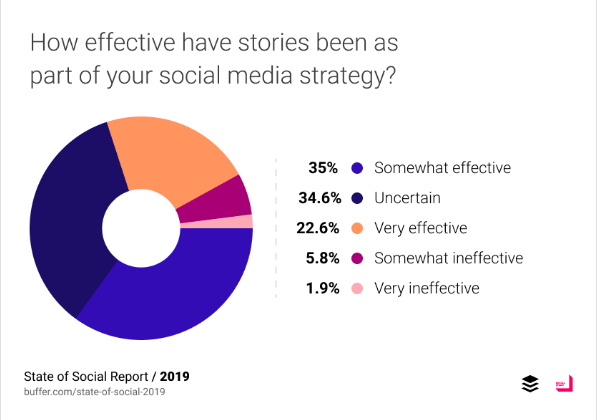 Even though 57% of marketers said Stories were very effective or somewhat effective, a whopping 35% said they were “uncertain” of overall effectiveness. Now, some of that uncertainty could be chalked up to the fact that Stories are still relatively new, but I still uneasy about the fact that 1 in 3 marketers can’t ascertain whether Stories is working or not. After all, Instagram does give you a wide range of metrics within the platform. Everything from impressions to click backs to click forwards. 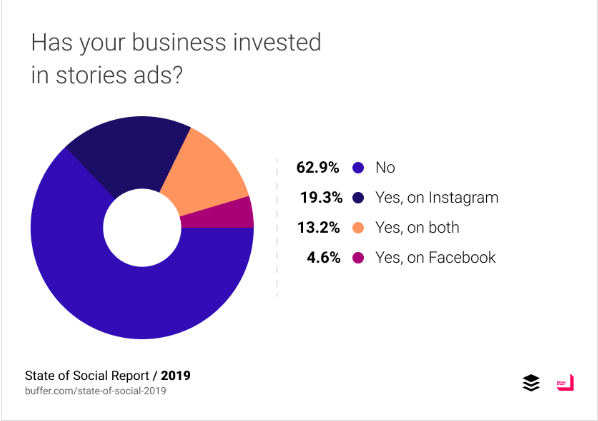 But, the more concerning thing is that most marketers haven’t even invested in Instagram Story ads yet–a full 63%. So, we have almost a third of marketers who aren’t quite sure how things are going with organic Stories, and we sit on the precipice of almost two-thirds of marketers who haven’t invested in Stories yet, but most likely will try, in the year ahead. Yikes. Folks, we have a real problem with influencer marketing. Look no further than the recent Fyre Festival docs on Netflix and Hulu for proof. First, we have less than a quarter of all marketers saying influencer marketing has been very effective–and the same amount saying they are uncertain about whether it’s effective or not. 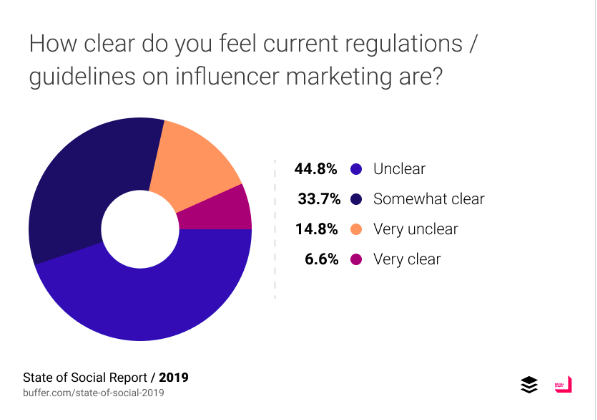 Then, you add to the mix that almost 60% of all marketers are either unclear of VERY unclear about what current regulations and guidelines mean for influencer marketing. Are you freaking kidding me? The worst part? 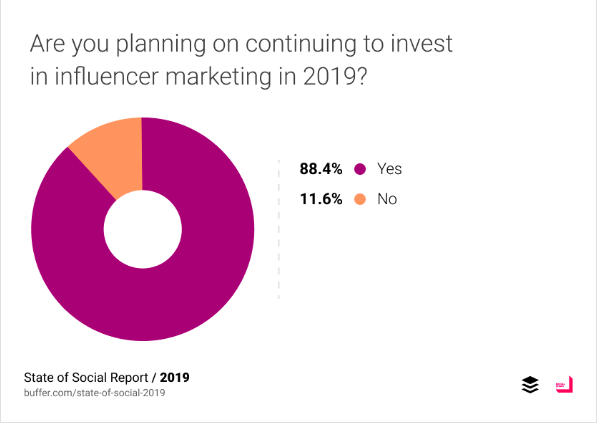 Despite all this uncertainty among marketers, a whopping 88% say they plan to invest in influencer marketing in 2019. 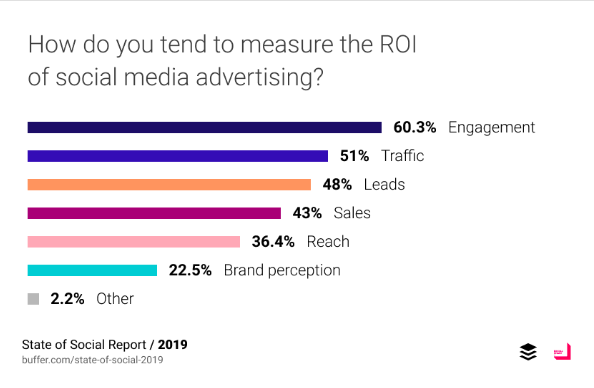 To recap, a full third of marketers either question IM’s effectiveness or don’t know how effective it is, and almost 2 in 3 marketers couldn’t tell you to put #ad or #sponsor at the top of an influencer post, but almost all of them want to invest in it in the year ahead? Yeah, this should go VERY well! For the last three years, there’s one trend that I would say has been pervasive in social media circles: Video. Prognosticators have been predicting the surge in video for years. And, to a point, they’ve been right. According to Buffer, only 15% of all marketers now NEVER publish video content on social media channels. However, only 1 in 4 said they published video weekly. And a full 37% said they published videos monthly. What’s more, most of that video seems to be going to two channels: Facebook and YouTube. 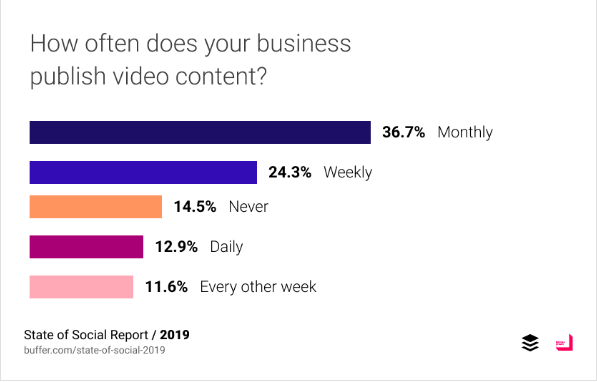 In fact, as called out by Buffer, only 32% are using video on LinkedIn (huge opportunity in 2019, folks!). So, despite all these predictions of video over the last few years, I see no signs of saturation. 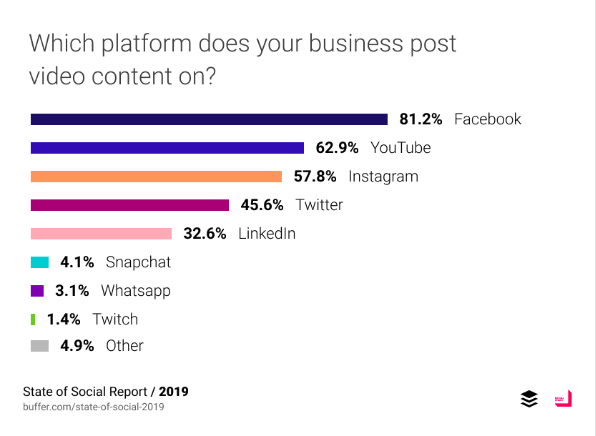 In fact, I see quite the opposite: continued opportunity for brands–especially on platforms like LinkedIn (for sure) and Instagram. When you look at this chart, what do you see? 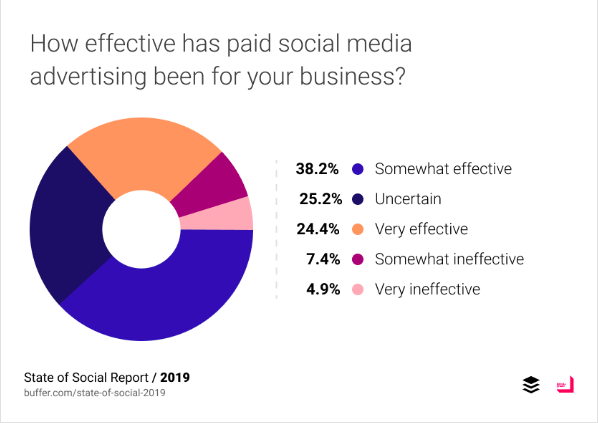 What’s obvious (and surprising) is a full quarter of marketers have no idea if their paid social efforts are effective or not. In 2019 that doesn’t seem possible. But, I think what’s behind it is the complete lack of analysis among a big segment of marketers. I’ve seen it first-hand over the last nine years. I’ve seen so many people spitting mindless reports back at clients and colleagues–and very few marketers providing thoughtful analysis of the data and what it actually means for clients. This chart wreaks of this. 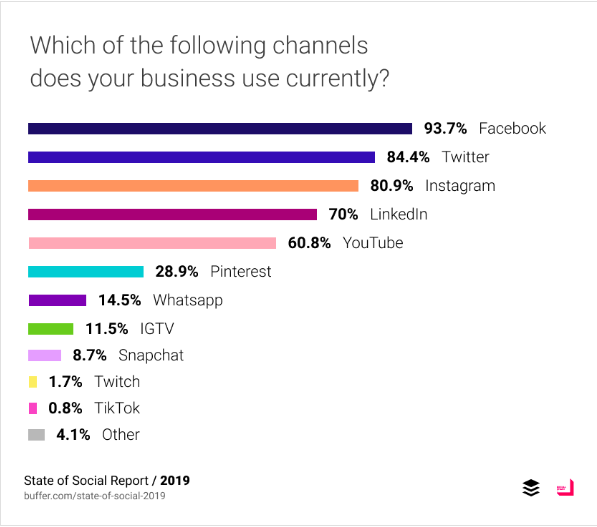 What’s noticeable about this chart is the wide chasm between the Big Four (FB, Tw, IG, LI) and the other niche networks (Pinterest, Snapchat, TikTok, etc.). Everyone knows most companies are probably using all four of the Big Four in one way, shape or form in 2019. But, as the data suggests, a much smaller number are using niche social networks. After all, channels like Reddit and Nextdoor didn’t even show up on this list! But, I believe it’s those niche networks that will deliver an increasing level of value in 2019 and beyond. The more the Big Four become saturated, the bigger the opportunity with these niche networks. Here’s what’s confusing. Charts and research like this show brands care about engagement–in many surveys, like this, engagement is #1! 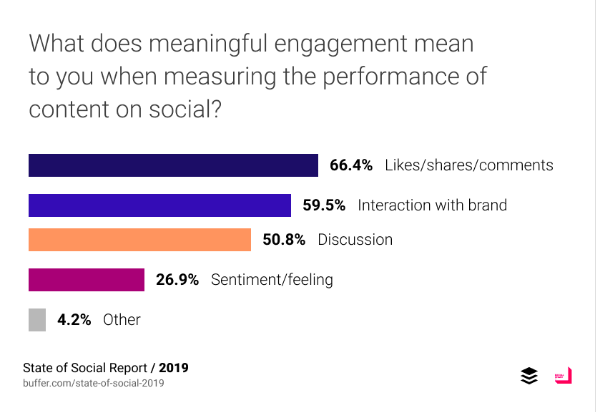 And in measuring this engagement, brands typically say they care about likes, comments and shares–the standard measures of social engagement. Except if you review many brands’ Facebook, Twitter and Insta pages, you’ll notice one thing missing: Replies from the actual brands! Yes, they care about “engagement” as long as they don’t have to engage. I just wrote about this very trend. The way I see it, “brand engagement” now equals customer service as many brands staff channels like Facebook and Twitter with customer service teams. Brands jumping into proactive, positive conversations about topics they care about on social media simply doesn’t happen anymore–at least not for most brands. Almost 9 in 10 companies use some form of third-party tool or technology to manage social media. This should come as no surprise, as third-party tools like Buffer have proliferated at a dizzying pace the last 5-7 years. So much so that massive consolidation is probably right around the corner. But, what I’ve noticed over the last several years is that many of these companies are paying for tools and tech they simply don’t need. In some cases, these companies would be perfectly fine using free tools or the platforms themselves to post and measure. Tools like Sprinklr and Spredfast are great–they really are. But, they’re also complete overkill for the lion’s share of brands out there due to ALL the feature and functionality they have. Even the most sophisticated brand couldn’t use it all.